Lois, a volunteer with the Blue Earth Nicollet Counties Humane Society will read stories and let you meet one of her therapy dogs. You may even get to see a trick or two! Our latest public art initiative is our largest yet – literally and figuratively. Australian artist Guido van Helten will create a one of his larger-than-life murals on the Ardent Mills silos in City Center Mankato’s Old Town District, right in the heart of the downtown. City Center Partnership is looking for an intern focusing on marketing, communications, and administrative support. The City Center Partnership is excited to commence phase two of INFUSE, part of a larger initiative called Artists on Main Street, a partnership between Minnesota Main Street and Springboard for the Arts with support from the Bush Foundation. 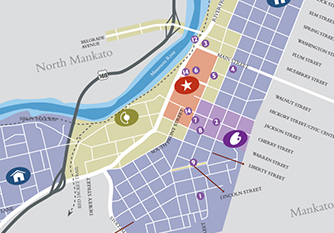 City Center Mankato is 180 blocks that offers unique experience you’re looking for. Whether it’s our vibrant local dining, specialty shopping options or exciting entertainment that brings you to Mankato, you’ll certainly leave with an amazing experience set amongst great public art and surrounded by fun recreational opportunities. Copyright © 2019 City Center Partnership. All Rights Reserved.